We all know how badly Hurricane Sandy devastated our area. For once I was glad the media hyped it to death. Many communities were close to 100% evacuated and countless lives were saved because of it. Having survived Hurricane Irene and tropical storm Lee and the resulting power outages and floods, I know that advance warning and preparation take some of the pain and suffering out of an event like that. Then, I gathered supplies. I shopped for some essentials like pasta and beans and cheese and eggs. And PopTarts. I had to get unfrosted strawberry PopTarts. Why? Because PopTarts are flood food. Thomas’ first (and only) experience with this snackfood was during last year’s floods. How could I NOT get him a box this time in anticipation? Would he even remember? Flashlights and batteries and candles were placed in easily accessed areas. We filled with water every last empty soda bottle that I hadn’t yet returned to the store for deposit (can I get points for inadvertent preparedness due to laziness?). I had 2 big ‘muck buckets’ of water outside my back door positioned beneath the gutter to catch any rainwater. That water would be perfect for flushing. 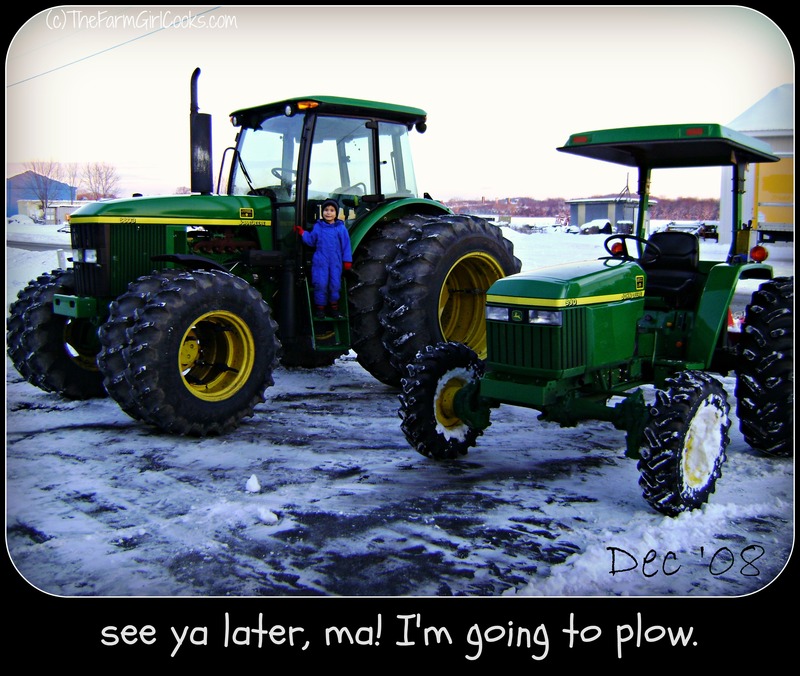 I made sure I washed every last stitch of clothing so The Boy would have an adequate supply of jeans and long-sleeved shirts should the power be out for more than a few days. After all of that was done, I let the washing machine fill with water. That water was nice and clean and perfect for washing dishes and by the time the power came back on 8 days later, my large-load washer was nearly empty. The fridge wasn’t overflowing with food, which is unusual, but I made sure to clean out anything that was ‘borderline’. The freezer, on the other hand, was nearly at capacity. I know that a full fridge or freezer stays colder longer than an empty one, so I put as many water-filled soda bottles as I could fit into the refrigerator. I emptied one ice cube tray after another into a plastic freezer bag and stuffed the bag between the frozen fish and the ice cream so as to eliminate vacant space in the freezer. What’s the point, you ask? Well, in all that preparation I noticed that there were at least 7 pint containers of chicken stock and 3 quarts of various soups in the freezer. 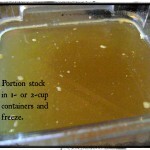 Lest the refrigerator warm up too much, I could take out a few pints of frozen stock and used them like ice packs! By the next day they were thawed and I could use them for cooking. 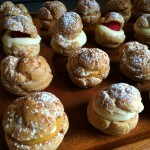 We hardly suffered at all, foodwise. What DID suffer in the aftermath was my supply of chicken stock. Who would guess that my non-carnivorous offspring would request chicken broth with pasta stars for lunch most every day he’s home from school? 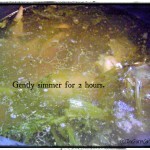 If you have a few hours around the house, do yourself a favor and make a big batch of this stock. 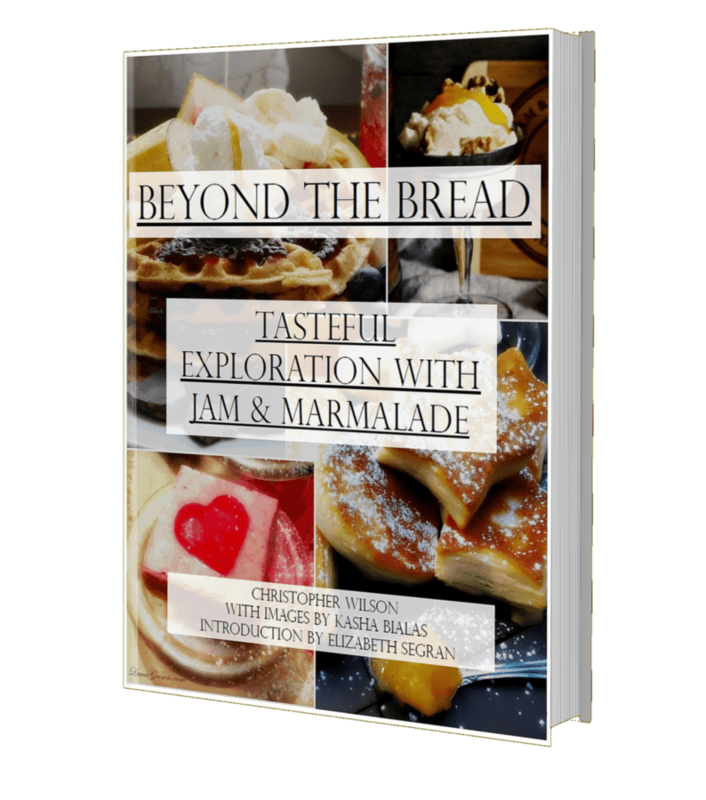 There isn’t much active involvement so you can do lots of things, like decorate a Christmas tree or do lots of online shopping, while it simmers gently and the flavor develops. 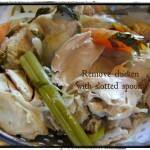 Pile a bunch of cut up chicken in a stock pot. 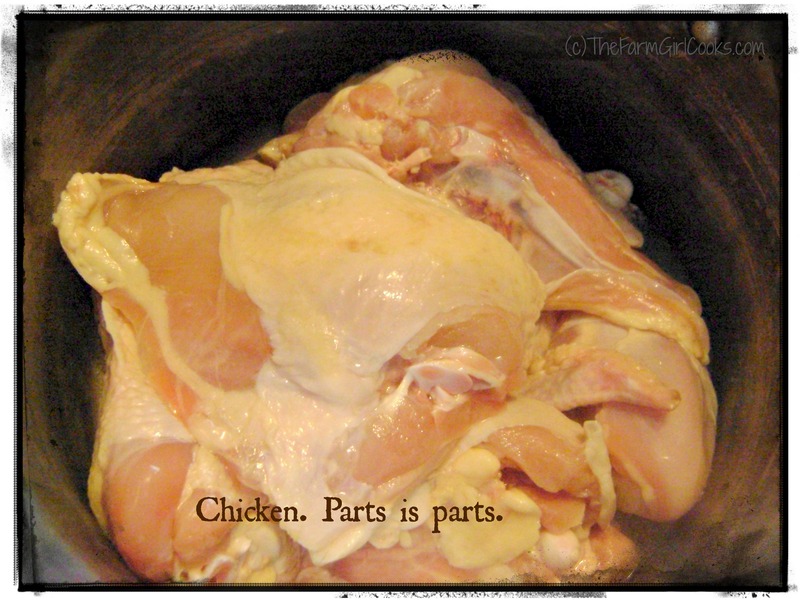 You can certainly use a whole bone-in chicken if that’s all you can find, but… parts is parts. 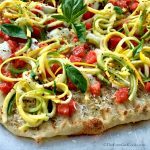 Gather a bunch of aromatic vegetables and cut them into large chunks. 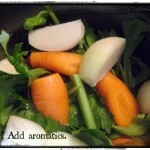 I use onions, carrots and celery, including the leaves whenever you can get them. I don’t use garlic or parsley or anything else. 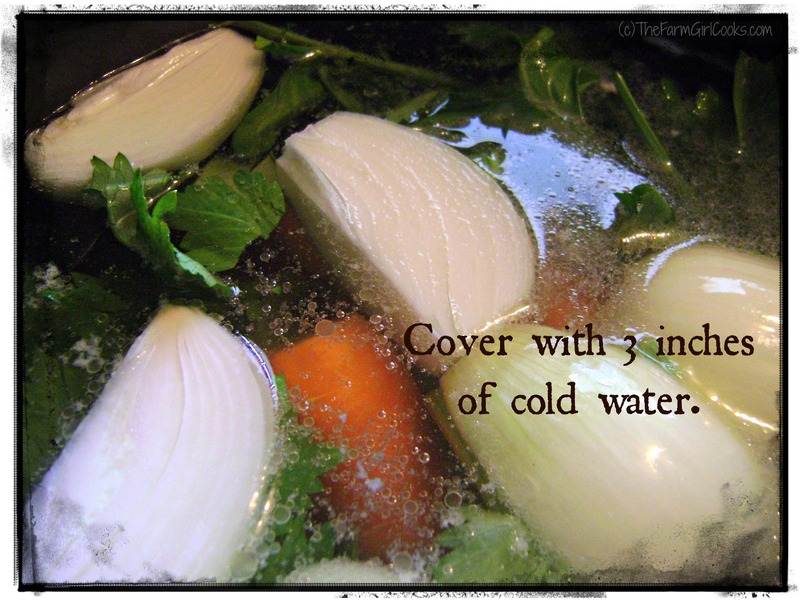 Fill the stock pot with cold water, covering the contents by at least 3-inches. 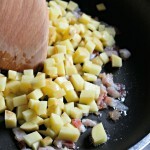 Add about 2 teaspoons salt and bring to a simmer over medium heat. 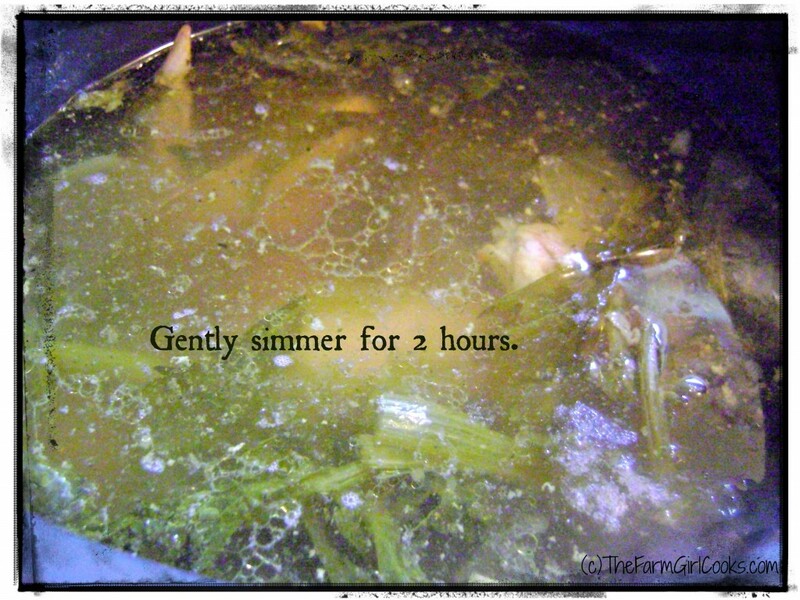 Do not boil the stock, rather, keep the liquid at a very gentle simmer. If it boils too hard you’ll have a lot of ‘scum’ to skim off the top. After about 2 hours, you can get back to work in the kitchen. Set up a colander over a bowl or pot large enough to hold the stock. 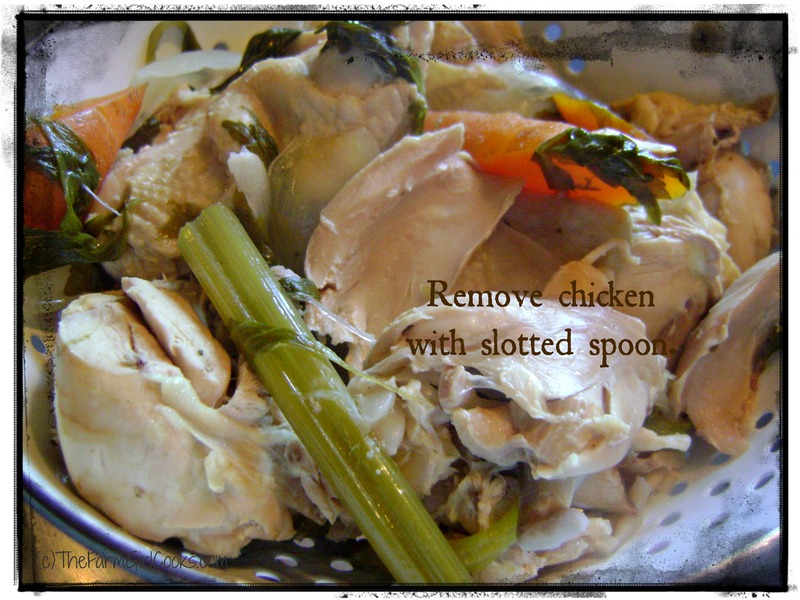 Carefully scoop out the chicken and most of the veggies and place them in the colander to drain a bit. 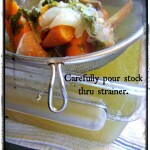 You’ll get quite a bit of stock dripping so don’t rush it. Move the colander to a plate or shallow bowl so you can strain the remaining stock through a fine mesh strainer. 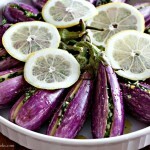 Eat the very soft vegetables OR discard them. Admire your work with pride. 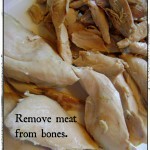 Carefully remove the meat from the bones. 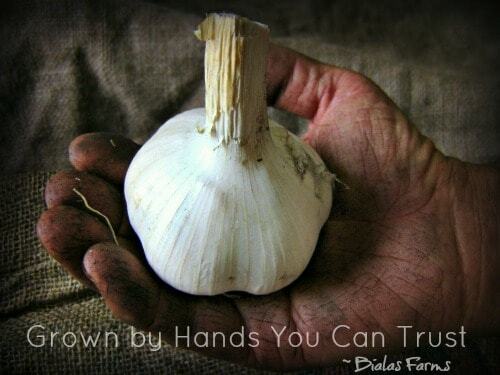 Yes, you use your fingers. Search for ‘the oyster’. Eat the ‘oyster’. 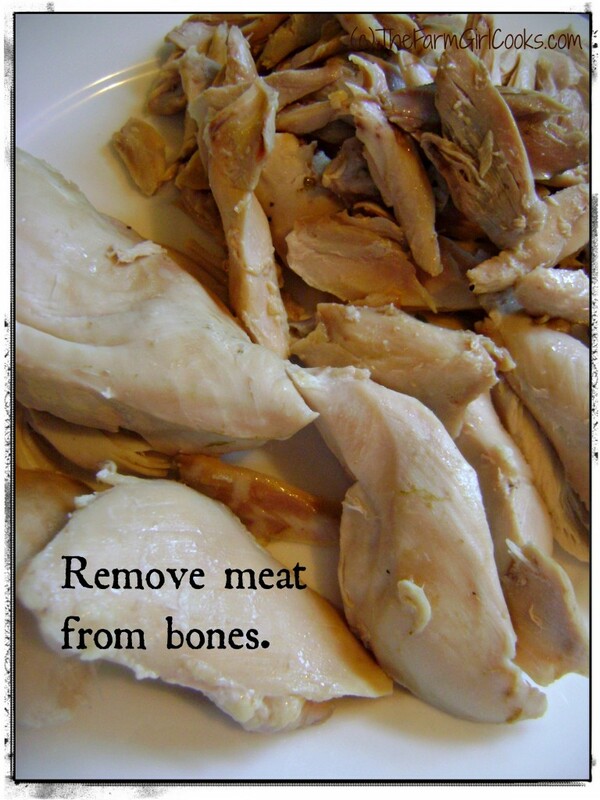 Mentally slap your own hand to remind yourself that this meat is for soup (or chicken salad or pot pie or tostadas). Find the other ‘oyster’. Refrigerate the stock overnight (or half a day should be fine). 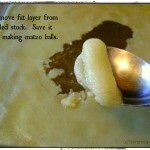 Carefully scoop off the fat that has solidified on top. 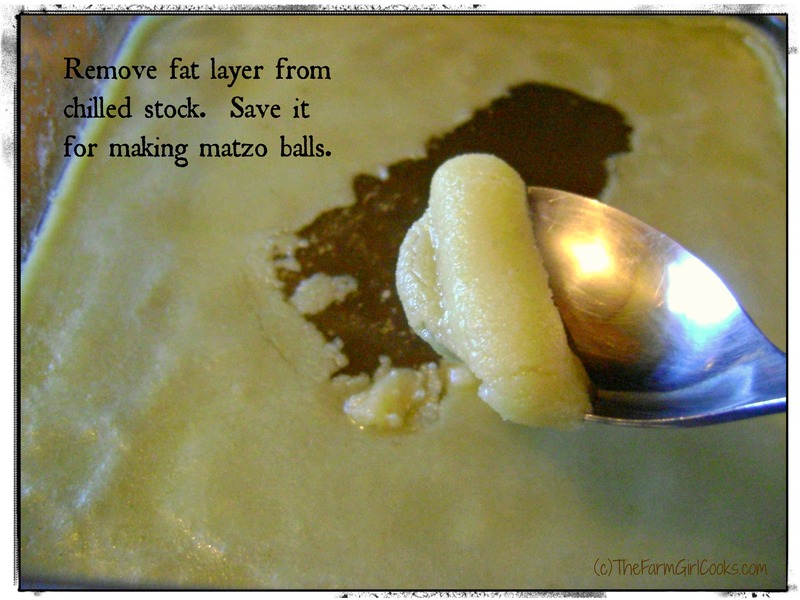 Always save this and freeze in 1/4-cup quantities if you like to make matzoh balls. It really does make that much of a difference. 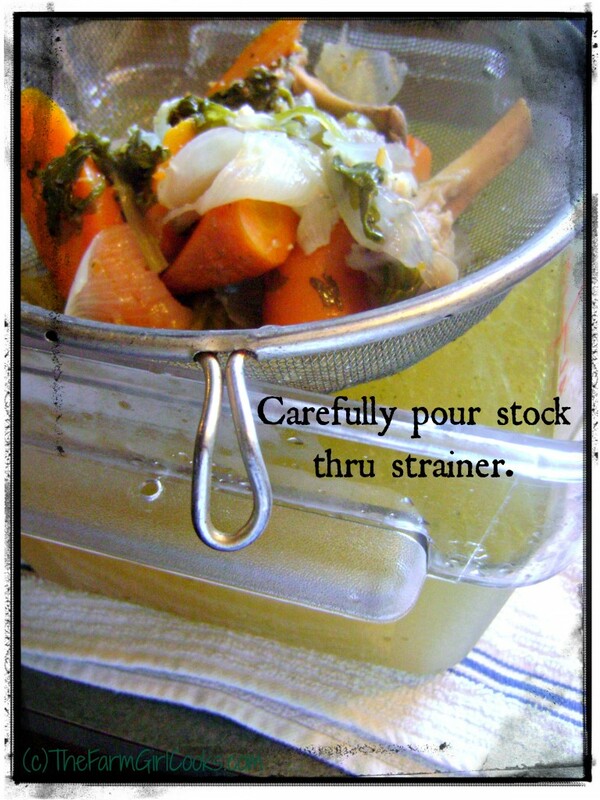 You can certainly use the stock right away, but if you want to save it, portion it out and freeze. 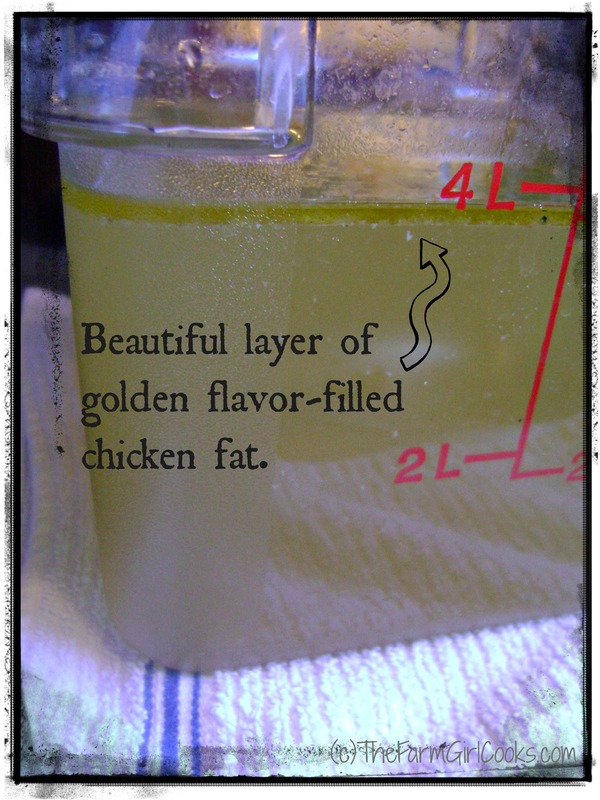 If you like to use a bit of virtually fat-free chicken stock to cook vegetables. 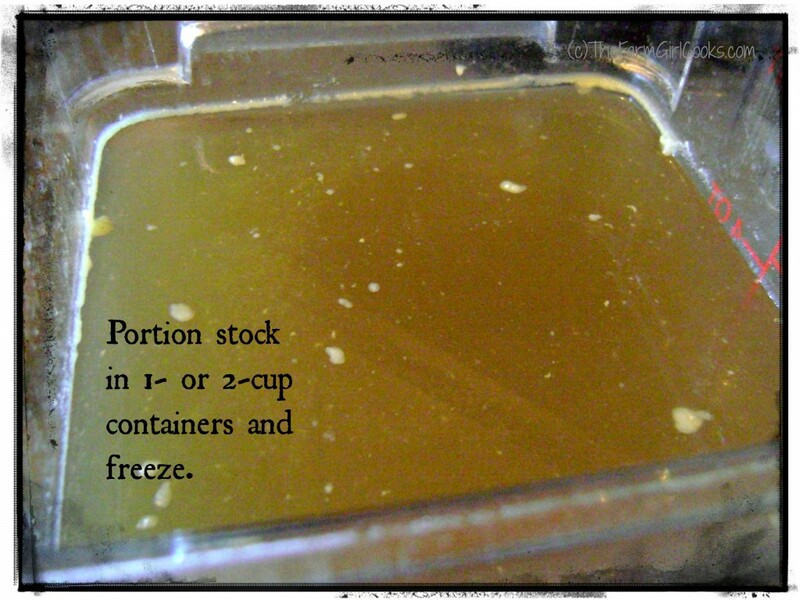 Consider freezing some stock in ice cube trays. Get an extra set from The Dollar Store – unless you like chicken-scented beverages. 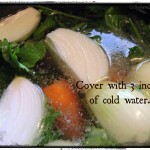 For a quick but delicious basic chicken soup. 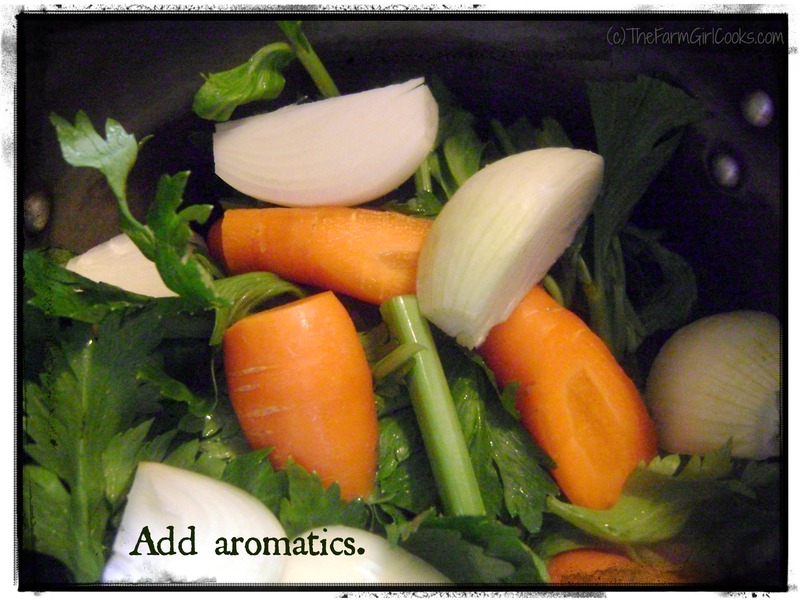 Simmer diced celery, carrots and onions in stock along with any reserved chicken. Season with salt and pepper if needed. For matzoh balls, buy the mix and make it with the chicken fat you saved. 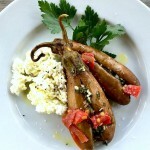 Serve together and prepare to sigh and squirm ’cause it’s that good. I read this article and found it very interesting, thought it might be something for you. 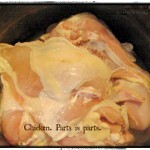 The article is called Back to Basics: Chicken Stock and is located at https://thefarmgirlcooks.com/back-to-basics-chicken-stock/. 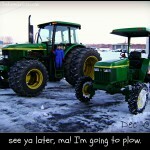 Yep, mix. There’s really not much in it…. The link isn’t working for me, Judy. I don’t have a blogger account. 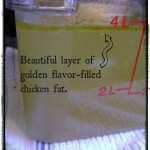 I have always wanted to make my own chicken broth and always am way to lazy. 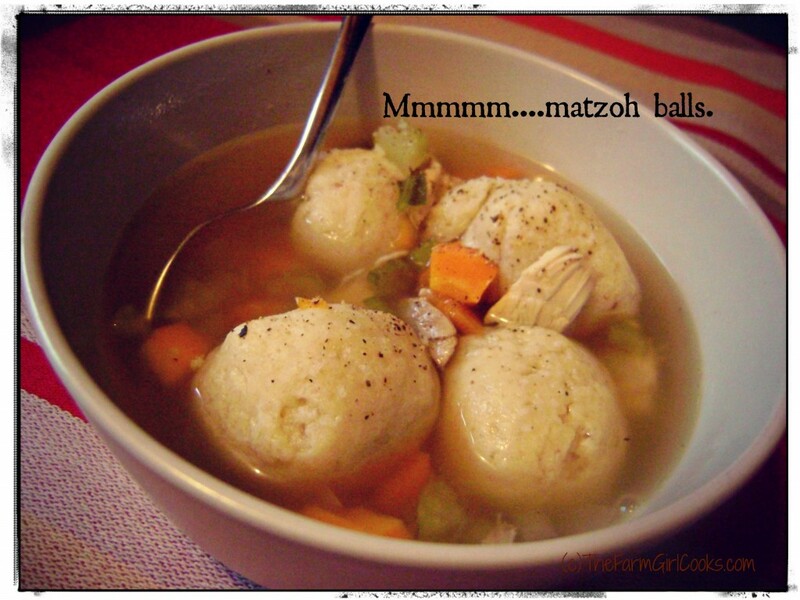 The addition of using the fat to make Matzah Balls better might just get me into gear though. Thanks for the tip! I watched Ina Garten make stock the other day and she must’ve had a dozen different ingredients in her pot. 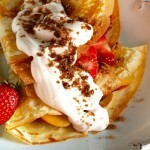 Doubt she’s cooking for an 8 year old, however, so in my case… simple is best. 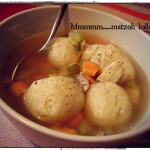 Please, please, please try adding the schmalz to the matzoh balls and let me know what you think!